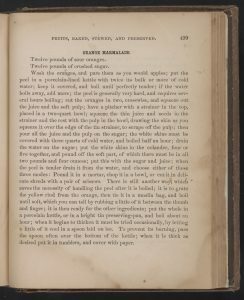 The Archives at the Historical Society is home to several cookbooks from the 1800s. One of my favorites is Elizabeth Smith Miller’s In the Kitchen ©1875 and revised in 1903. There are several reasons why I like this particular book. First, is Elizabeth Smith Miller (1822 – 1911) herself. 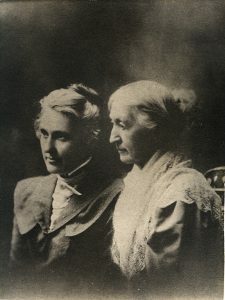 She was born near the Wadsworth Estate in Livingston County, to noted philanthropist and abolitionist, Gerrit Smith, and Ann Carroll Fitzhugh of the prominent Fitzhugh family. Well educated, with part of her teen years spent at a Quaker school in Philadelphia, she married Charles Dudley Miller of Cazenovia in 1843. They moved their family to Geneva in 1869 bringing along Elizabeth’s idea for a piece of clothing that was an adaptation of short skirts and trousers, called “bloomers” (after Amelia Bloomer from Seneca Falls who made it famous). Mrs. Miller’s independence of thought led her to become an ardent and lifelong suffragist. Second, she had the courage to vouch for every recipe in her cookbook. She admits that some are French, some German, some English and some American. She lets us know that many of the receipts (old fashioned spelling) are from hand written books by Northern and Southern families renowned for their savory dishes. The thing I find interesting is some of the dishes in the book are local creations. Though she doesn’t give the authors of all the recipes, there are enough local credits given to allow it to qualify as a “local” cookbook in my mind. She mentions Mrs. G. of Rochester, and gives Mrs. William Smith credit for several recipes. While I know that William Smith of William Smith College did not marry there was another William Smith in Geneva who did have a family and I believe this may have been his wife. Third, this isn’t just a cookbook it is local history. I can look at the names connected with some of the recipes and find the women’s families listed in the City Directories. It is exciting for me to know I am recreating a dish that a woman over one hundred years ago prepared for her family or friends. History surrounds us every day in things as common as a recipe book, a sewing box, or a jewelry box. Not all history is grand buildings, grand works of art or magnificent documents. A mundane recipe can tell us about what was available to eat, what people thought was good to eat and how traditions in eating have changed. It can also play a part in genealogy by putting us in touch with great grandma’s special spaghetti sauce recipe, for example. I checked two of the contributing families from the cookbook, Smith and Bogart, discovering the City Directory for 1873-74 had two possible Smith families and the 1903 had four. I looked up the Bogart family and found there were a couple of possibilities in the 1900s. Since Mrs. Miller mentioned when a contributor was from an area other than Geneva I am relatively certain she is using recipes from our local families. What recipes did Mrs. Wm. Smith and Miss K. H. Bogart contribute? One I have made myself is Mrs. Smith’s Grape Catsup. Yes, catsup in the 1800s and early 1900s was made from many different fruits. In the Kitchen has several catsup recipes including cucumber, lemon and tomato. Mrs. Wm. Smith also contributed a lemon pudding recipe that looks quite tasty. Miss K. H. Bogart contributed several cake recipes including Harrison Cake and Aurora Cake. These recipes also give an idea what types of food products were available to cook with, for instance the fruits mentioned include quinces, oranges, peaches, pineapples, apples, grapes, lemons, currants, raspberries, cherries, plums, blackberries, strawberries, and gooseberries. Vegetables mentioned are artichokes, asparagus, spinach, green peas, string beans, lima beans, corn, potatoes, tomatoes, celery, squash, cabbage, cauliflower, onions, carrots, parsnips, turnips, beets, peppers, egg plants and mushrooms. I was surprised at the large variety of fruits and vegetables available in the late 1800s and early 1900s. Obviously these were not available at all times of the year as they are now and they were surely more expensive than some families could afford, but they were available at some point to some folks or the recipes would be useless. Another recipe book in our archives is a reprint of Grandmother Grosvenor’s 1827 Cookbook complied by Virginia Allee. Her grandmother, Cornelia Bogart Grosvenor was born in Geneva in 1809. At the age of eighteen she married Godfrey John Grosvenor, a prominent Geneva lawyer. This book contains a family history, and reproductions of their wedding portraits. Everything from medicinal recipes to desserts is included in this book, which was copied from Cornelia Grosvenor’s hand written notes. It is a wonderful window into a family bringing their daily lives to life for the reader. As with most old cookbooks, I find the instructions for the actual baking missing. There are no handy temperatures or lengths of time to bake the cake or bread included. If I want to make any of these dishes I will have to experiment and hope I get the formula correct. I encourage all of you who have family recipes on little slips of paper tucked in the front of your favorite kitchen reference to take the time to create a family cookbook with them. What better gift can you give an engaged couple than a collection of favorite family recipes. With a few family anecdotes it becomes a piece of living history that can be added onto from generation to generation. Here’s Mrs. Wm. Smith’s Grape Catsup Recipe from In The Kitchen. I have used this catsup on poultry and pork as a condiment and it really compliments both meats well. It can be processed with a water bath canning method as you would grape jam. Boil the grapes in enough water to prevent burning, strain through a colander and add all the ingredients and boil until a little thickened; bottle seal.